Rules clarification about Iroas, God of Victory final ability. How does triggered abilities, triggered by the sae effect stack? Does phasing out creatures protect them from being affected by board wipes? Algae Gharial - When do the tokens apply on a boardwipe? Leave Skullclamp in if you think you can get a good amount of value off it to draw cards. 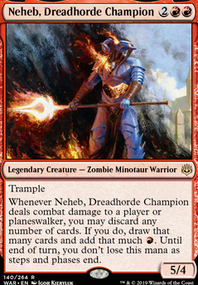 I would still take Tajic out since he doesn’t really stop any board wipes not including Blasphemous Act and Starstorm You don’t have too many enter the battlefield effects for Restoration Angel to do all too much work. 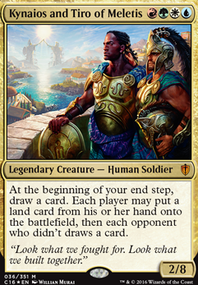 Valorous Stance can probably be removed since you already have instants that kill stuff better and protect your creatures better. 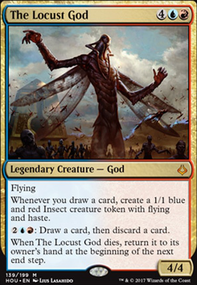 Gamble while being one of the only tutors Boros has I don’t think it is all to necessary in this deck because it can be devestating for the tutored card to be removed. This is frankly fantastic. Another damage increaser that effects almost all of our spells, is not symmetrical, and has a baby bolt attached to it. "Doubles" Raid Bombardment damage output on top of making each Goblin hit for more. Adds to Repercussion and Blasphemous Act . Ibsplosions hit for 5 instead, which is a very relevant milestone for X/5 creatures that we used to not be able to do anything about except with Soul-Scar Mage . 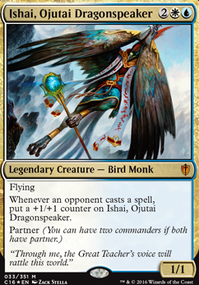 Really just a solid card, and will be going right in alongside new Krenko when they come out. Great looking deck you have here! I think the only vital Ib-related card you are missing is Soul-Scar Mage . Its only non-bo is Repercussion (creatures wouldn't be dealt damage anymore, so nothing to carry over to the player), but otherwise it makes every exploded Goblin much better. It also improves the potential of Blasphemous Act so it can permanently maim say an Emrakul, but it can also kill Indestructible creatures. The number of counters can also be doubled with the damage doublers in the deck, as you can choose to have the doubling resolve before the replacement effect does. Your landbase looks good, and I like the inclusion of Path of Ancestry . I miss having fetches and have started to add them back in, because they also help a lot with Scroll Rack / Sensei's Divining Top , Experimental Frenzy , and the Surveyor's Scope . I've been considering adding Goblin War Drums for a while now, and after reading your list last night and walking through a bunch of combat ideas, I am definitely going to make some space for it. Not so much for the free shots at players where the Goblin doesn't die (why Blood Moon + Goblin King is so good), but also the idea of having a very tiny Nemesis Mask effect spreading blocked damage (and Repercussion damage) to at least 2 creatures. I think it even makes Goblin Sledder better by proxy just because you get more Goblins through unblocked sometimes. I really like the effect of Vicious Shadows but the CMC always turned me off. I've never actually ran it though, so it may be better than I think just because I see how leery people would be of boardwiping, and that's half the struggling in my meta anyway, rebuilding after wipes. Boggart Shenanigans would be the budget CMC version, but it also has the more budget effect. So I'm not kidding when I say I didn't even realize Massive Raid was an Instant until I read this, haha. I just knew I wanted another Goblin War Strike and Massive Raid is the next best one. Looks like it is even better than I thought! Saccing mountains and killing, blocking attacks, and then killing someone with Raid all on their turn just sounds awesome. That's all I can think of right now. I still am really happy that you've built out the deck! 2 years ago when I started working on it and no one thought Ib could command anything but a chaos deck I never thought it would get to this point. If you have any other questions or ideas, let me know! the best boardwipes are cards that work in the highest number of different situations. what are you going to do when you have In Garruk's Wake in hand on turn 5 when you're facing down a lethal board of vampires. The same goes thing goes for Drown in Sorrow , it's not bad turn 3 to clear the board of dorks, but what if you top deck turn 11 when you're looking for an answer to Ulamog, the Infinite Gyre . The other thing you should focus on in boardwipes is mana cost. The best boardwipes allow you to wipe the board and follow it up with another play. I rarely ever run single target removal in my commander decks anymore, instead running boardwipes, or multi target removal cards such as Decimate or Crush Contraband . You can never hope to generate card advantage if you always plan on trading 1 for 1 with your opponent. 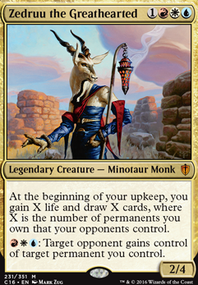 And for the last question, put in as much card draw effects as you possibly can, not one time uses like Read the Bones , but cards that draw over time like Phyrexian Arena or Grim Haruspex . @hejtmane I'm not using it strictly for the indestructible clause though. It's just a way to wipe the board (most of the time) that's fairly cheap in these colors. Like I pointed out, most red boardwipes have x in their cost and can be exponentially more expensive while also having clauses like hitting non-flying. 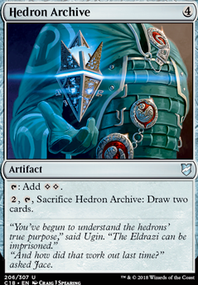 And anything in blue that is comparable is really only a temporary answer as blue has mass removal that returns it to hand. When I pick up another copy of Cyclonic Rift I will be adding that in here as another option. 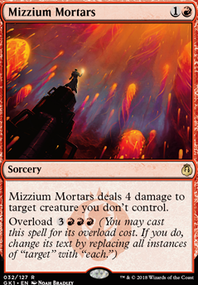 But for now I have to rely on Blasphemous Act , Hour of Devastation , and an overloaded Mizzium Mortars as my sweepers to go alone with a couple of targeted removal spells in order to keep board states in check.